Map the Meal Gap 2017, the latest report by Feeding America® on food insecurity and the cost of food at both the county and congressional district level, reveals that food insecurity exists in every county in the Terre Haute Catholic Charities Foodbank’s service area. Overall food insecurity ranges from a low of 13.4% of the population in Clay County up to 17.4% in Vigo County. The national average food insecurity rate across all counties is 14%. The study also finds that people currently facing hunger are likely falling further behind as they continue to struggle to buy enough food to meet their needs. Food-insecure individuals now face, on average, a food budget shortfall of $15.34 per person each week, up from $14.91 last year. Terre Haute Catholic Charities Foodbank is one of 200 food banks in the Feeding America network that collectively provides food assistance to 46 million Americans struggling with hunger. Through a network of 90 soup kitchens, food pantries, senior centers, youth centers, and other charitable agencies, Terre Haute Catholic Charities Foodbank collects, warehouses, and distributes the equivalent of 2.5 million meals annually to more than 32,000 individuals. 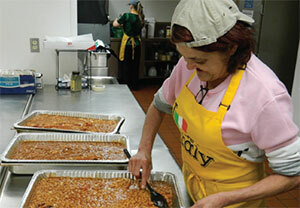 40,210 individuals living in west central Indiana are food insecure. Of those, 12,000 are children under the age of 18. Dr. Craig Gundersen, Professor of Agricultural and Consumer Economics at the University of Illinois, Executive Director of the National Soybean Research Laboratory and a member of Feeding America’s Technical Advisory Group is the lead researcher of Map the Meal Gap 2017. 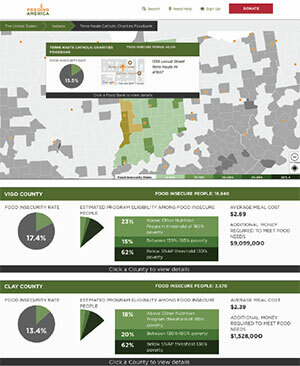 A summary of the findings, an interactive map of the United States, and the full report are available at map.feedingamerica.org. Join the conversation about Map the Meal Gap 2017 on Twitter using #MealGap. We’ve all probably heard at some time in our upbringing that we live in the greatest country in the world. I agree. There is likely nowhere else on this planet that you can live and expect the freedoms we are afforded. Because we have been blessed with much, so much is then expected of us as well. Of course many of us might find it easy enough to understand the meaning of life and liberty, however, the pursuit of happiness can be something quite different for each of us. It is most certainly difficult to imagine how we can ever go forward in this effort without having our basic needs met and food – as well as the access to food – is surely a basic need. and food insecurity. For our Feeding America national partners this information helps us shape policy and advocate for programs that can create stability for families in need. At a local level this data can help us place more emphasis on those communities and neighborhoods where the need is greatest. Historically, all of our service area counties demonstrate a percentage of families above the state and national average for food insecurity. Your help is needed now more than ever! September is Hunger Action Month. I want to invite you to visit our website at ccthin.org and learn more about what you can do every day to help reduce hunger. Because when you provide help you have the opportunity to create hope and that is how we will someday bridge the gap of hunger. awarded a Walmart State Giving Grant totaling $65,000. That, along with funding through the Catholic Community Foundation and Catholic Relief Services, is being used to create a Food Service and Food Safety Training Program. The goal of this program is to provide job training for adult learners wishing to enter the workforce while simultaneously providing approximately 41,975 meals to feed hungry individuals at the Soup Kitchen. The program provides low income and unemployed individuals the opportunity to learn food service skills such as food preparation and cooking, food safety through ServSafe, skills to be wait staff, and managerial skills such as scheduling, menus and food inventory. An advisory committee made up of local volunteers, chefs and food service industry leaders met over several months to create a 12-week training program, which includes weekly skills demonstrations and ServSafe education along with hands-on kitchen experience. The weekly demonstrations and training modules are taught by local chefs while weekly menus are created to reinforce the skills learned. Each successful student is presented with a certificate of completion and special gifts to help him or her with their career. Best of all, Catholic Charities is offering this program free-of-charge to all accepted applicants. If you need help finding food or know someone who does, call the National Hunger Hotline at 1-866-3-HUNGRY (1-866-348-6479). The Hunger Hotline is available Monday – Friday from 9am – 6pm. All calls are free and confidential. 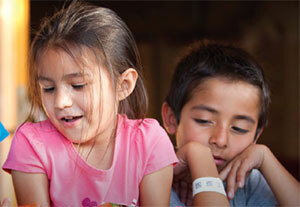 Help someone you know receive the nutrition they need to remain healthy and productive.